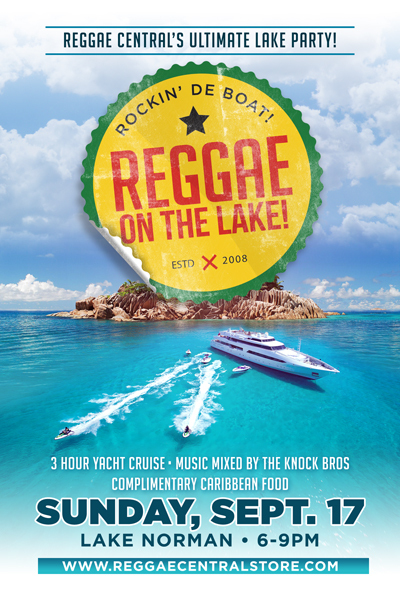 On Sunday, September 17th, Reggae Central will host Reggae on the Lake, a 3 hour cruise on a chartered yacht, sailing the waters of beautiful Lake Norman. Aboard this cruise you will be treated to non-stop Reggae music, free Caribbean hors d’oeuvres, and prize giveaways throughout the evening. The yacht charter is equipped with multiple levels for your enjoyment, featuring front and rear decks, comfortable seating areas, and smaller, more intimate lounge areas. The upper level of the yacht is transformed into an open-air dance floor, with the Knock Brothers spinning the best in Reggae, Dancehall, Soca and Classics all night long. The upstairs level also features a cash bar with all ABC permits. Attendees on the cruise should dress comfortably, casually, and for the weather as there are many open areas on the yacht you will want to experience on your 3 hour tour of Lake Norman. The open-air dance floor is literally the best place on the lake to dance the night away to your favorite Reggae tunes. Tickets are cash only and $50 per person, available only at Reggae Central, 1506 Central Ave, Charlotte NC 28205. Store phone: 704-377-2782. Space is limited. We hope to see you there! In the event of inclement weather, the production will take place while the yacht is docked.